Tower Systems offers more free POS software training for small business retailers | Tower Blog | A blog about smart POS software for independent small businesses. 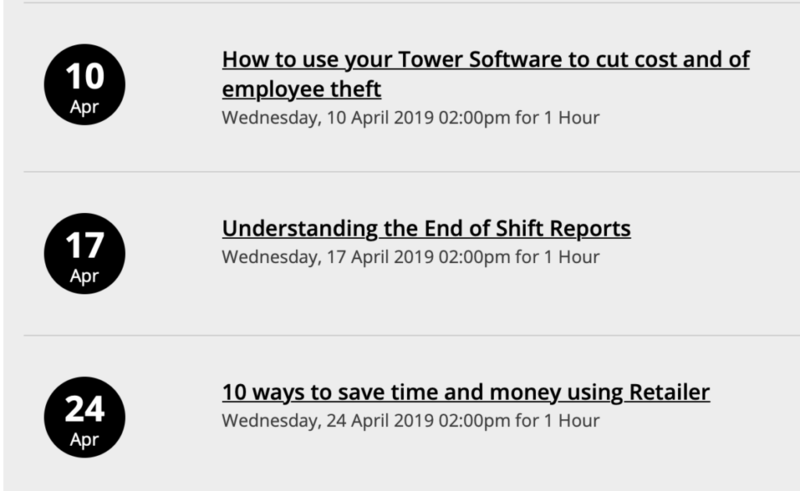 Here we are in April 2019 and our free online POS software training workshops continue to draw good small business retailer engagement. Each workshop is live, with plenty of time for questions one the topic covered as well as on any other topic. To participate in an online meeting all you need access to is a computer with a broadband internet connection and a phone to receive a call so you can hear the audio. Each session runs for approximately 45-60 minutes depending on questions. The face to face meetings are yearly in capital cities and regional centres across Australia. These are in addition to our weekly online live sessions. We also attend more than twelve industry trade shows offering face-to-face meeting opportunities with users.